You can recover your lost or forgotten password using password recovery software (password crackers). LastBit Software offers wide range of password recovery solutions including Express Recovery for Word and Excel documents (it takes just two minutes regardless of the password length! ), Access, Zip, Outlook password recovery, Internet password recovery and much more. As a PC user, you will understand the need to keep track of numerous passwords and names, especially if you are also an Internet user. One solution is to write them down or store them on your PC but this is risky. Anyone can read your lists and gain access to your valuable data or even worse, your bank account details. My Password Manager is a password storage program that will relieve you of the password management chore while offering you complete security and peace of mind. Your precious information is stored as encrypted data that only you can access. Access codes to computer accounts. Passwords for programs (For example ICQ and Outlook). Passwords for files (For example Excel and Word files). Remember, My Password Manager keeps your passwords, logins, credit card numbers and any other confidential information in a very securely encrypted form but this information is always immediately available to you. Web forms auto fill feature. Install the program to a Removable Device such as a USB memory stick. Quick access to accounts via bookmarks. Removing files completely and permanently, this is called "wiping". Customizable automatic data backup features. Encryption of data files with the 256-bit Advanced Encryption Standard (AES) algorithm. My Password Manager has a built-in customizable password generator. Convenient data search features for when you store large amounts of data. Feature to import data from a file. Feature to export data to a file, export to password-protected HTML page. A highly intuitive interface in the style of Office XP. Orderly storage of any secret information such as passwords. All program settings are automatically saved. Works from the system tray. Icons for folders and accounts. Creating, copying, editing and deleting accounts is easy and convenient. Multilingual support (English, French, Czech, Dutch, Ukrainian, Simplified Chinese, Greek, German, Russian, Korean). My Password Manager encrypts all stored data using the US Department of Defense approved 256-bit Advanced Encryption Standard (AES) algorithm. This guarantees that only the rightful owner is able to access the data stored within it. No one else will be able to gain access for at least 500 years. That is how long it would take to "hack" My Password Manager with modern computing resources. My Password Manager uses an automatic backup feature that guarantees that the stored data will not be lost in the event of a hard drive failure. My Password Manager was created with "Mr. Joe Average" in mind. That is why the interface is clear and intuitive; resembling Office XP. In addition, the program features icons for folders and accounts, which makes navigating the built-in database very easy. There is even a search function, which can be a real lifesaver when the program is used to store passwords and logins for 2000 or so employees. My Password Manager includes a built-in strong password generator. Strong passwords have upper and lower case letters as well as numbers. This makes them impossible to pick or guess. You can specify the password format. My Password Manager includes a built-in strong password generator. Strong passwords have upper and lower case letters as well as numbers. This makes them impossible to pick or guess. The password format can be specified by you. My Password Manager provides instant access to your stored data when the correct password is entered. In addition to passwords, My Password Manager can store credit card numbers, bank account numbers, identification numbers, software/hardware serial numbers and so on. If required, this data can be easily exported to a file. My Password Manager has very low system requirements and there is no limit to the number of accounts/data files it can contain. Attention! Keep passwords for your My Password Manager data files in a safe place! If you lose or forget your password, there will be no way to restore it. My Password Manager has no backdoors and the secure AES algorithm makes it impossible to crack. 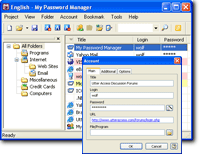 My Password Manager for Pocket PC has been launched. My Password Manager has been released. Recently we released a new version 1.9. Please note that registration scheme is changed in the new version, so your old registration code is not valid for the new version. If you want to upgrade to the new version please contact us, we'll send you a new code. Upgrade is free.